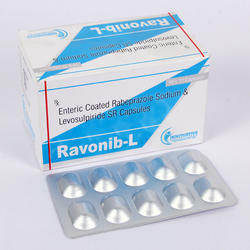 Ravonib L (Rabeprazole + Levosulpiride) is used in the treatment of gastroesophageal reflux disease (acid reflux), intestinal ulcers and irritable bowel syndrome. This is a combination of two medicines: Levosulpiride and Rabeprazole. Levosulpiride is a prokinetic which works by increasing the release of acetylcholine (a chemical messenger). This increases the movement of stomach and intestines, and prevents reflux (acid going up to the food pipe). Rabeprazole is a proton pump inhibitor (PPI). It works by reducing the amount of acid in the stomach which helps in the relief of acid-related indigestion and ulcers. Ravonib IV (Rabeprazole 20MG) Injection is a drug used in the treatment of stomach ulcers, Gastroesophageal reflux disease (GERD) and other acidity related disorders by decreasing the acid produced in the stomach. 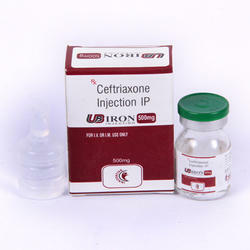 We offer Pharma PCD in Andhra Padesh. Offered products are prepared at ultra-modern processing unit by chemists using the finest quality ingredients with following industry set quality norms. Also, we offer promotional materials like a working bag, writing pads, dairies, visiting cards and many more.